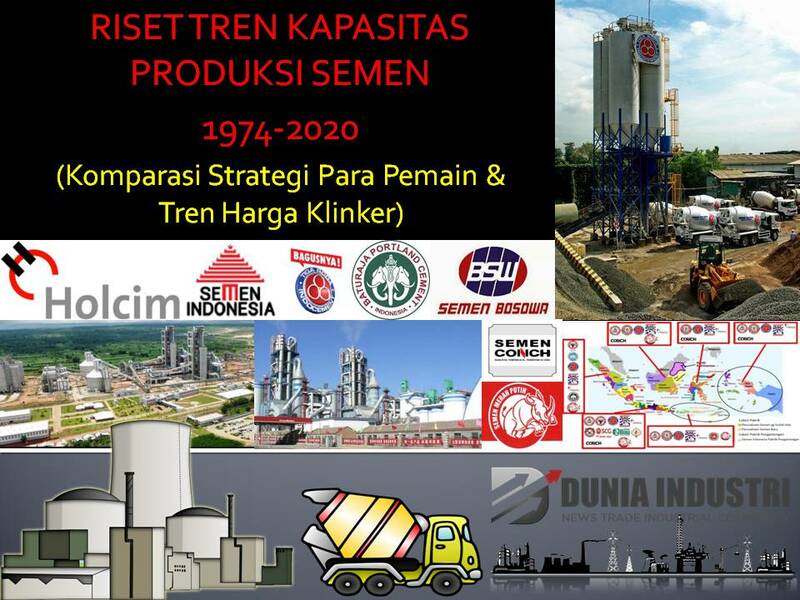 Research on Trends in Cement Production Capacity 1974-2020 (Comparison of Players Strategies and Clinker Price Trends) was released in the first week of June 2018 featuring the latest data and studies, comprehensive analysis, outlook and prognoses, and data and strategy comparative data for cement industry players in Indonesia in a fairly long period of 1974 to 2020. In this research, Duniaindustri.com not only presents projection data in the future, but also presents a long track record of data as a benchmark (trends) that occur in certain industrial sectors. Let’s look at the detail of the content per page. This data research begins by showing the market overview of cement market developments in 2017 (page 2). The growth of the cement market in 2017 is quite solid, supported by the acceleration of government infrastructure projects, although overshadowed by competition in the presence of a number of new players. Then followed by projected cement market conditions in 2018 (page 3) as demand is expected to slow down compared to 2017, given the political year sentiment. Going to the core of Cement Production Capacity Trends 1974-2020, on page 4 describes this research method and support data support used. Starting to enter the focus of research, on page 5 presented the history of the three oldest cement players in Indonesia, including the factor of its superiority at that time. Furthermore, there is a trend of increasing the capacity of the cement industry from 1909 to 1994, in five groups of years to explain the rise of the first cement industry players in the country (page 5). The capacity data of the first cement players in the country can be a valid track record for measuring future trends. The data is then analyzed by comparing the final conditions of 2017 to see growth over the last 43 years (page 6). On pages 7 to 10, the track record data is translated into a track record of increasing trend in market capacity of the cement industry leader in Indonesia. Market leaders are taken as an example that represents a changing trend in the industry. On page 11, the current condition of the capacity of the cement industry in Indonesia is reflected, ranging from capacity per company (total 15 companies), total installed capacity, factory utilization, share of state-owned enterprises, share of foreign and private companies. Related to the discussion of the share of foreign and private companies, it turns out that the four largest foreign giants in the world already have production facilities in Indonesia (page 12). This resulted in intense competition among giant cement companies in Indonesia (page 13), ranging from market share struggles, selling price pressures, productivity, factory utilization, to profitability or profit margins. Related to profitability trends and financial performance of three market leaders cement, specifically shown on page 14. On page 15, it shows the projected consumption and cement capacity in Indonesia from 2011 to 2020, as well as capacity distribution per company (both market leader, existing player, and new comers). Subsequently, on pages 16 and 17 the graphic displays corresponded to the trend of oversupply of cement in Indonesia in terms of installed capacity growth trends over consumption, as well as the factors that affected, for the period 1995 to 2020. As well as, the cement consumption projection table displayed in Indonesia from 2012 to 2022 along with the acceleration of government infrastructure projects. Starting on pages 19 to 21, the market analysis of the latest developments of the cement industry in Indonesia in 2018, ranging from price difference selling strategy, coal price pressures, profit margin development, and forward expansion strategy. 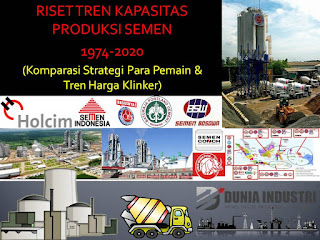 More specifically, on pages 22 to 37, Duniaindustri.com makes an independent assessment of the results of monitoring the development of business strategies per cement company in Indonesia, especially market leaders and new players. This business strategy includes expansion trends and targeted segments, future performance targets, selling price strategies, market share trends, and more. Continued on pages 38 and 39, graphically displayed interesting mapping development of production facilities of each cement player in Indonesia, thus providing a clear picture of the fight in certain areas. On pages 41 to 47, the discussion emphasizes the changing trend of market share of all cement players in Indonesia from 2010 to 2018, both for bulk and bulk sales, as well as projected market share per company in the period 2018-2022. Factors affecting market competition such as expectations of increased per capita consumption and accelerated realization of government infrastructure projects are also discussed on pages 48 to 50. Followed on pages 50 to 56 are shown market share from four market leaders per region in Indonesia. Subsequently, on pages 57 to 60, data on clinker price trends in Indonesia are shown, starting from the comparison of clinker prices of market leader and new comers, production cost per ton, price difference, and clinker import trend in Indonesia, from import clinker country , and the origin of cement import countries in Indonesia.